On evenings when my little guy, Henry, decides to sleep well, I enjoy the occasional paper piecing. 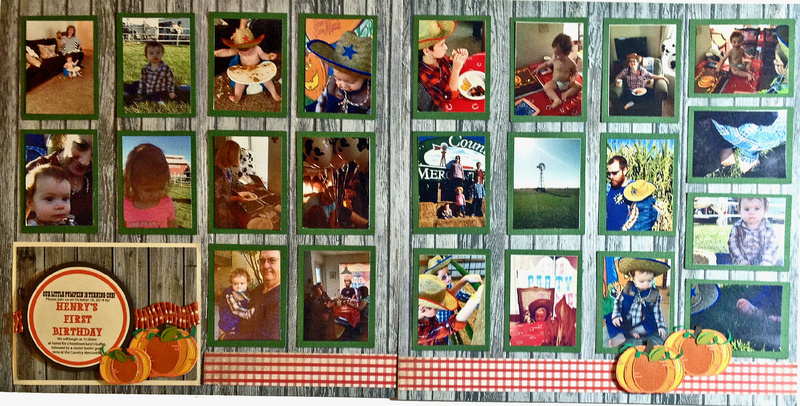 Granted, they make the scrapbook layout-making process much longer (this double-page layout took me a little over 2 hours), however, I am always so pleased with the results. 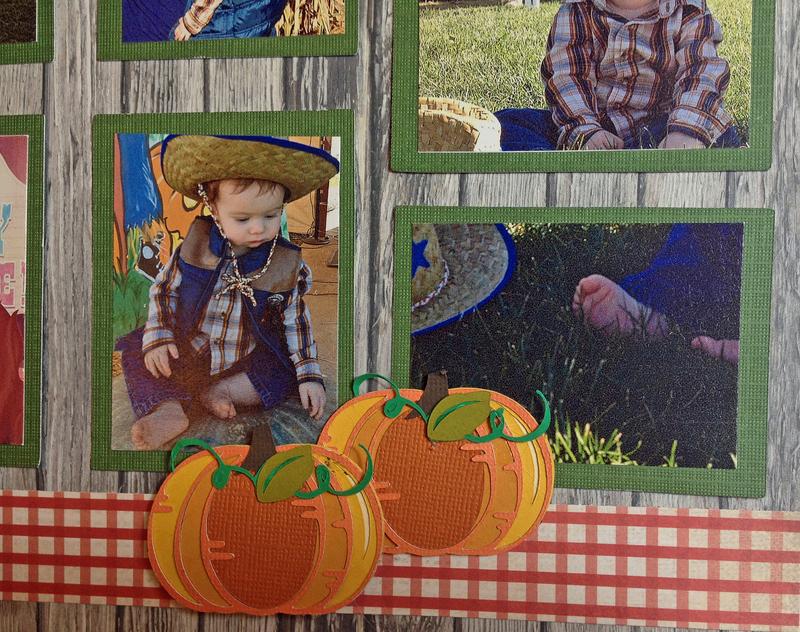 I used the Miss Kate Cuttables Pumpkins in Wagon SVG for my Cricut. 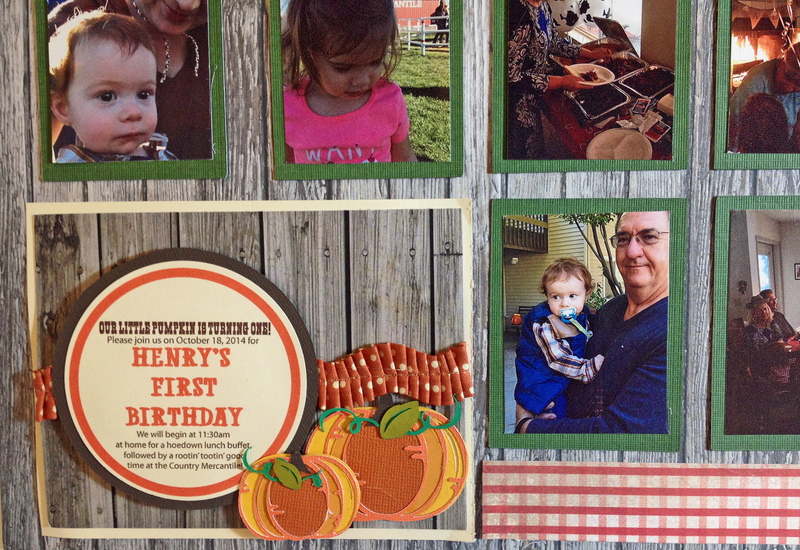 I originally incorporated the eight layer pumpkins into my invitations, and then realized how perfect they would be on the scrapbook page as well. 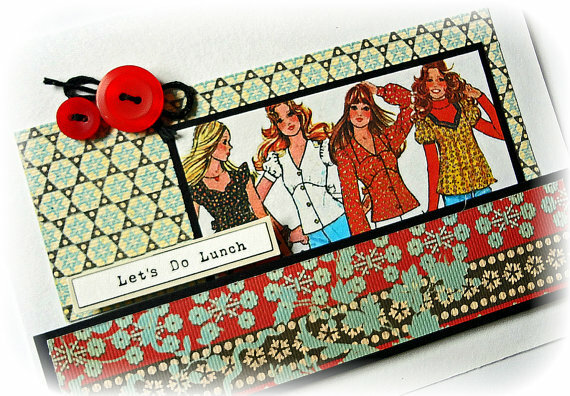 I used the invitation as my main embellishment, since it already contained all the party details. 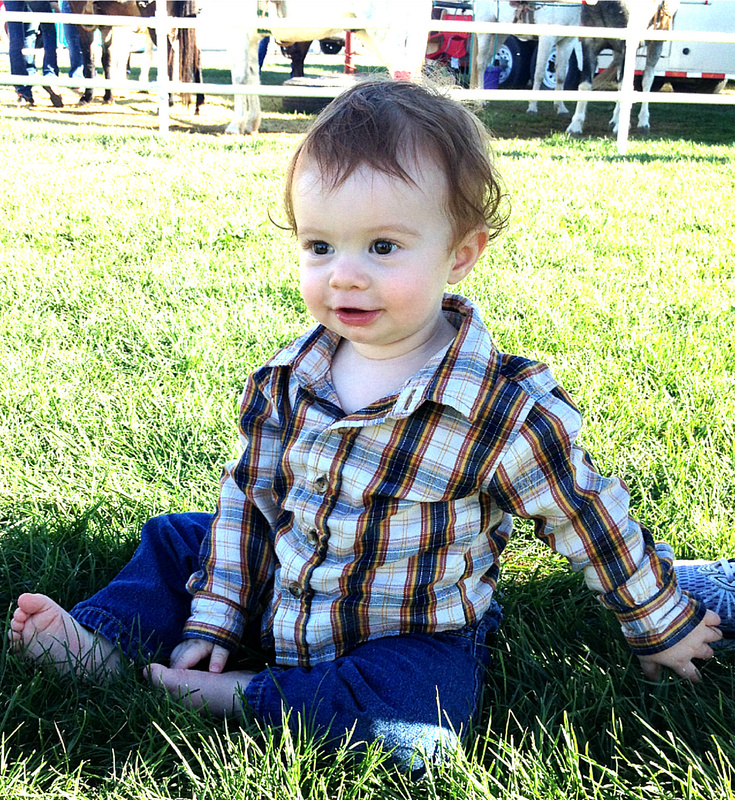 We had Henry’s birthday at the Country Mercantile pumpkin patch, so it was perfect! 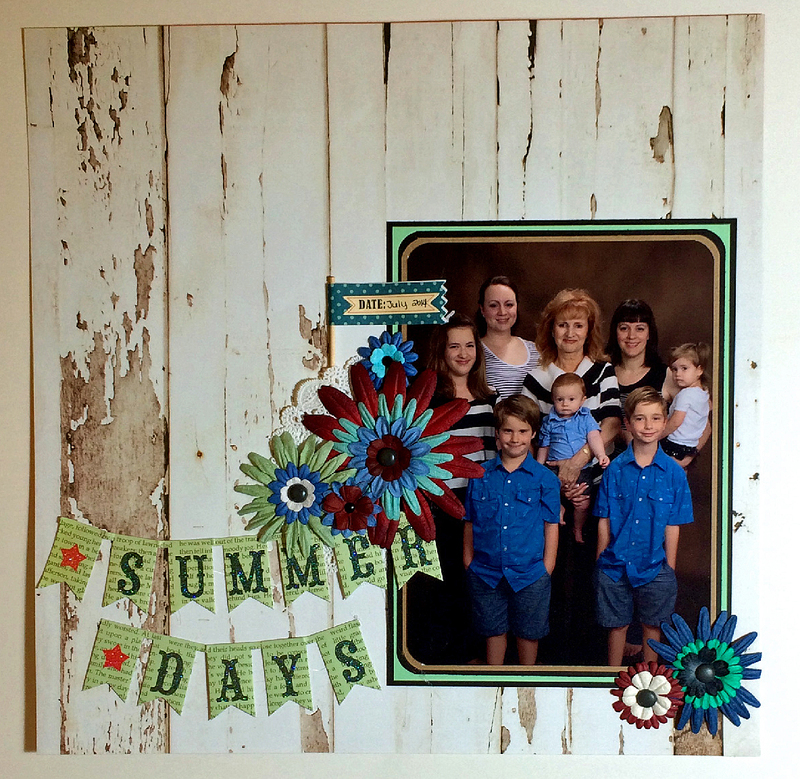 Would you love to have a fantastic scrapbook, but don’t have the time to make one? 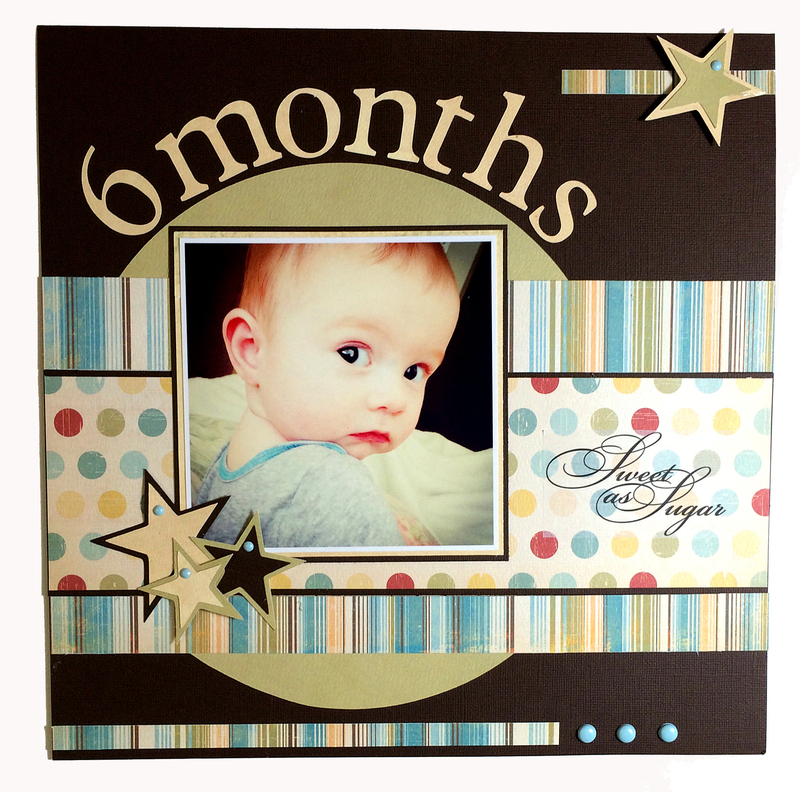 Please feel free to contact me regarding prices for custom scrapbook pages. Also, I have several ready-made pages available on my Etsy shop. Each is lovingly handmade with lots of fun 3D details. Simply add photos and enjoy for years to come! Thanks so much for stopping by, and happy crafting! Great product photos are everything – whether you are using them on a blog, for sales, or to have your images re-pinned on Pinterest. I am always looking to sharpen my skills. With a tight camera and lighting budget, I have to make do with what I have. 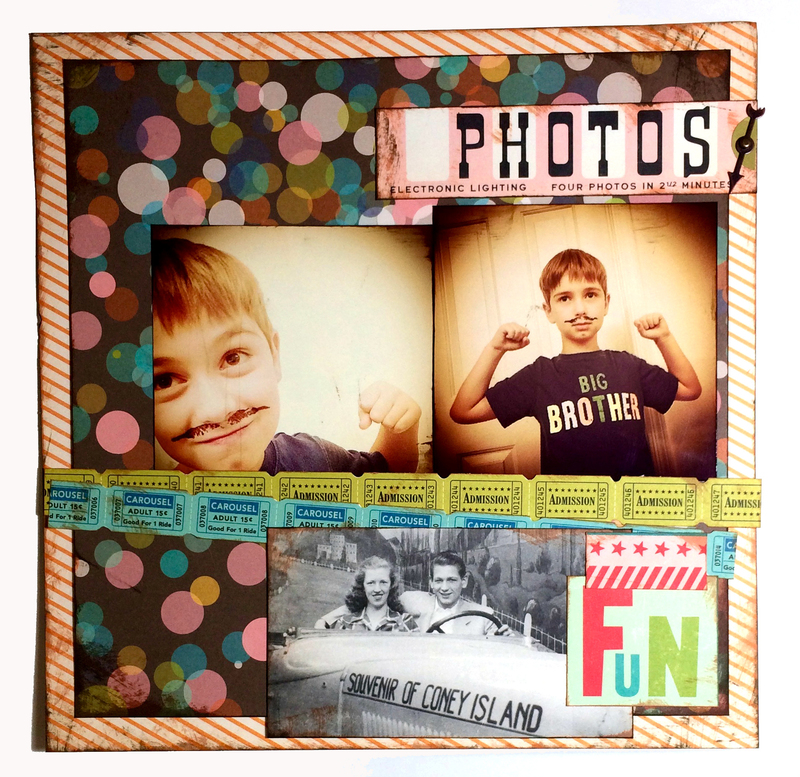 Below are some tips for using your iPhone to best show off your scrapbooking works of art. I used an iPhone 5s for these layouts. 1. 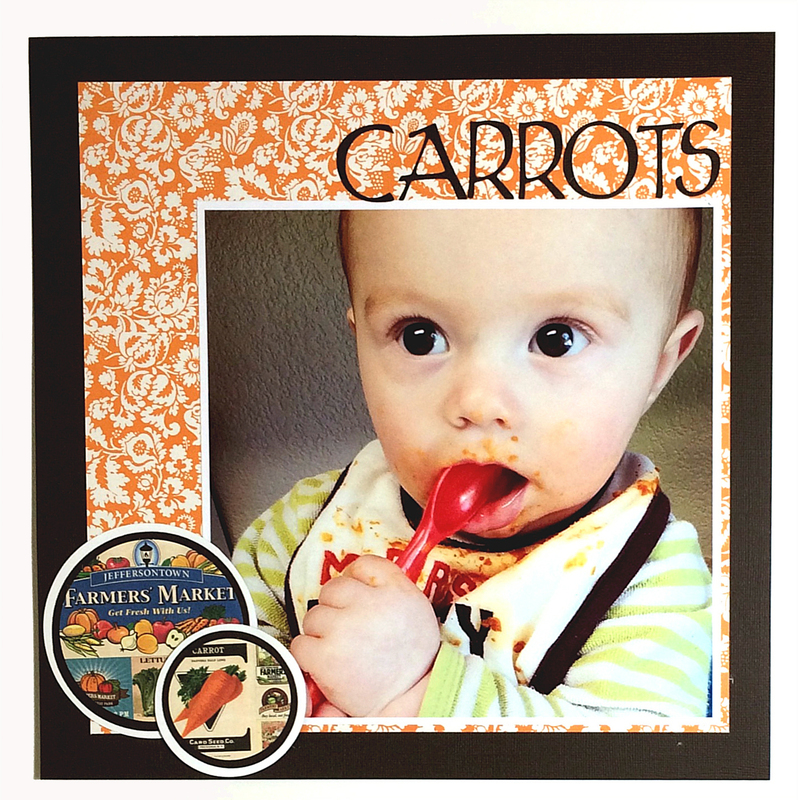 Purchase a large white poster board from the craft store (around $1.00). 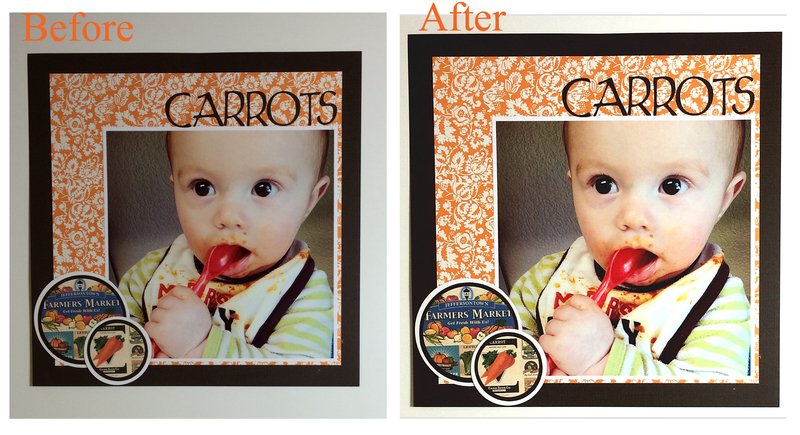 It helps to clear the background in the pictures and provide a nice, neutral base. I like to use the shiny side too, in order to get the most out of my available light source. 2. Choose your poster board position carefully. As you can see, I like to have mine next to my craft room window. I also used a standing OTT light to the right, to help balance the light (you don’t want a lot of shadows). Here is the view of my “photo studio” wall. 3. Stick a piece of tape behind the layout and affix it to the board. 4. Take the photo using some kind of stabilizing structure. I don’t have a tri-pod, so I usually use my desk with a box on it to help hold the phone steady. Take several pictures so you can choose the best one. 5. I then clean up the image using either www.fotoflexer.com (a free site) or Afterlight (a $.99 app). You can use these to play with shadows and lighting, crop and rotate, etc. I also use Photoshop Elements 5.0 at the very end to add white paint to the background, making it as bright as possible. Before and after editing my pictures. That’s it! Now you can save and share your masterpieces! With these tips, you can make sure your artwork is the focus – not a messy background. 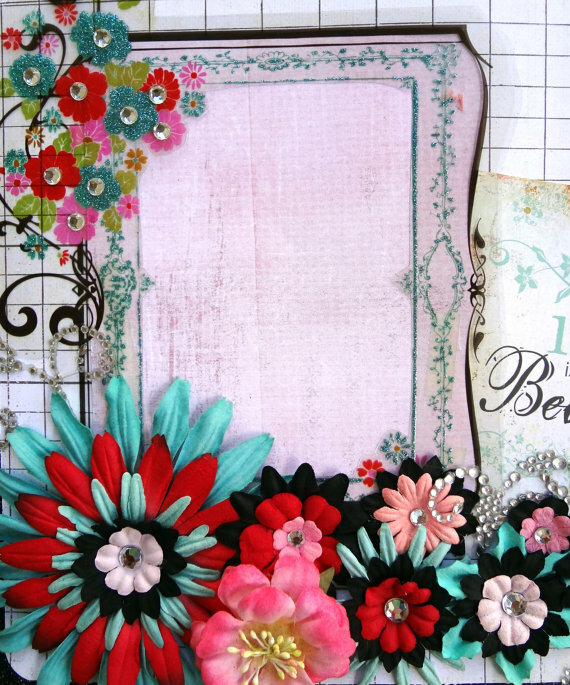 So much amazing scrapbook paper! What shall I ever do with all of it? 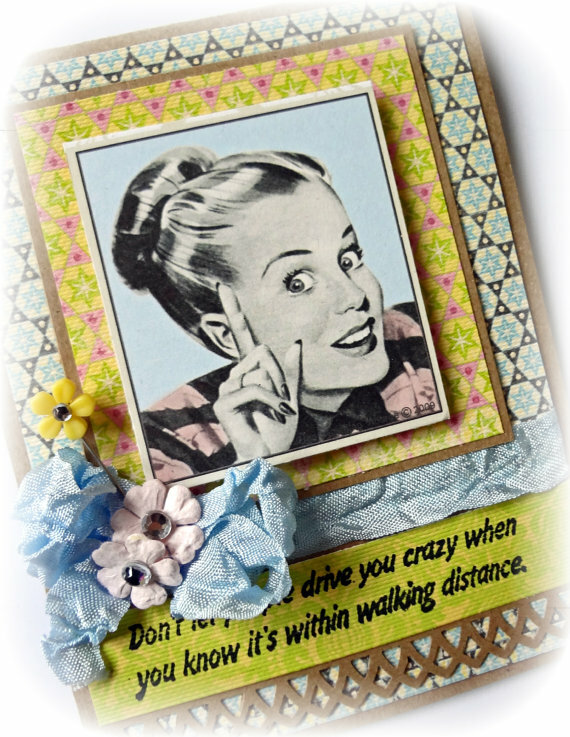 I love making greeting cards. Here are just a few of the pieces available now at my Bella Stitchery Etsy shop. 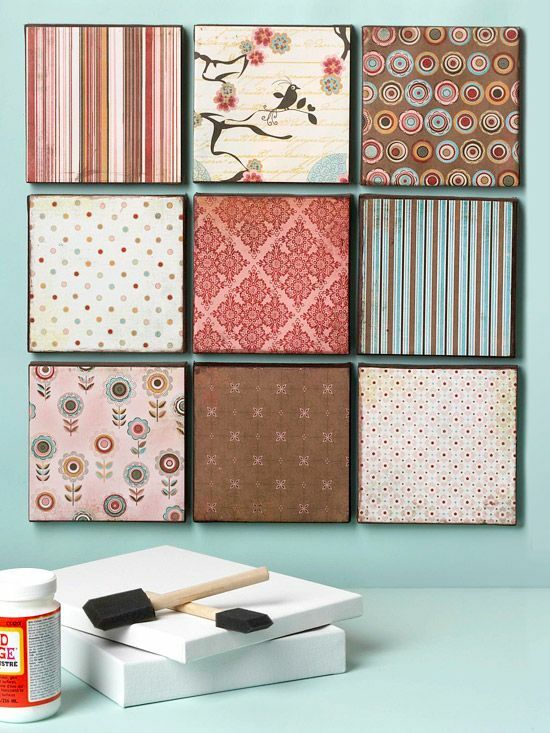 Super easy and a great way to display your favorite paper collection. This idea is from Better Homes and Gardens. 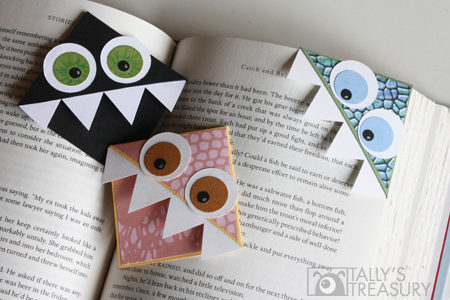 These darling monsters are sure to delight kids of any age. Learn how to make these cuties at Tally’s Treasury. 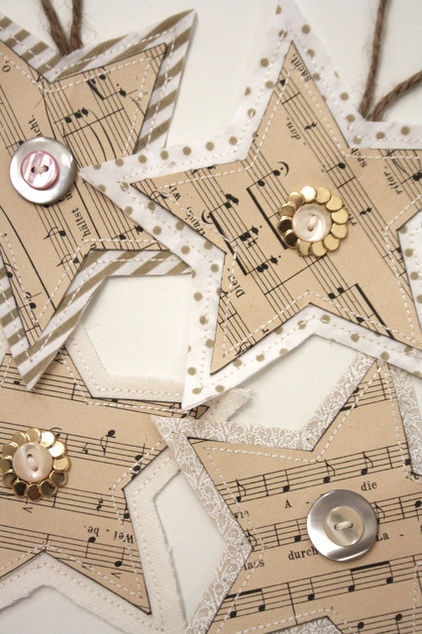 SOOOO many darling, simple ideas on the Internet to inspire ornament making! Here is just one example, from Houzz. 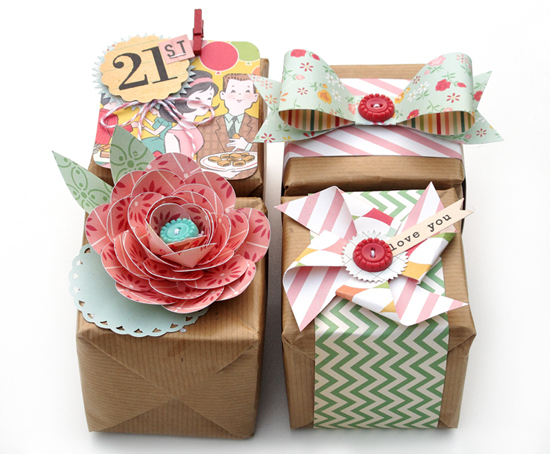 These boxes are flippin’ adorable – who cares what’s inside?! The paper used is from October Afternoon, my current favorite brand. No matter what year it is, snail mail will always mean something special. 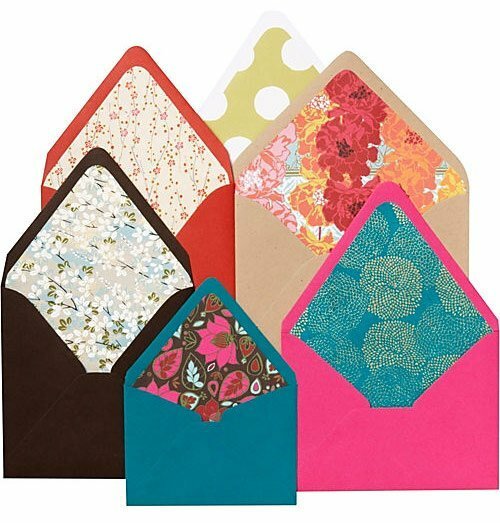 You can easily personalize your envelopes using scrapbook paper. You can find some template designs at Apartment Therapy. I found this great blog with a tutorial for twenty different paper flowers. Check out It’s Always Autumn for the directions. I have to admit, I’m a huge fan of banners. I make them for my fireplace mantle for the holidays, baby showers, bridal showers, birthdays. I am kind of obsessed. This is one I made for a baby shower a few years back. Baby shower banner I made for a friend. 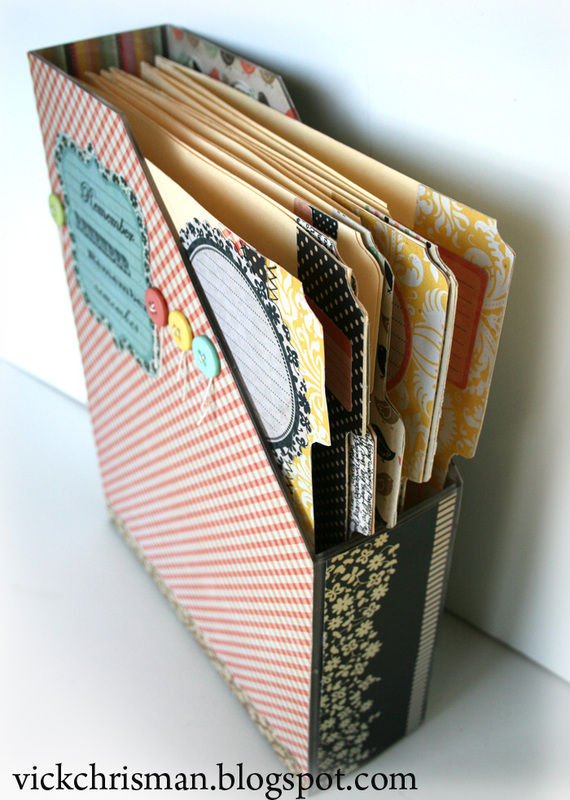 This adorable file folder is from This Art Makes Me Happy. What a great idea! I’m sure you can extend this idea to include things like desk drawer liners, pen holder cups – the possibilities are endless! Let’s not forget the obvious, too. 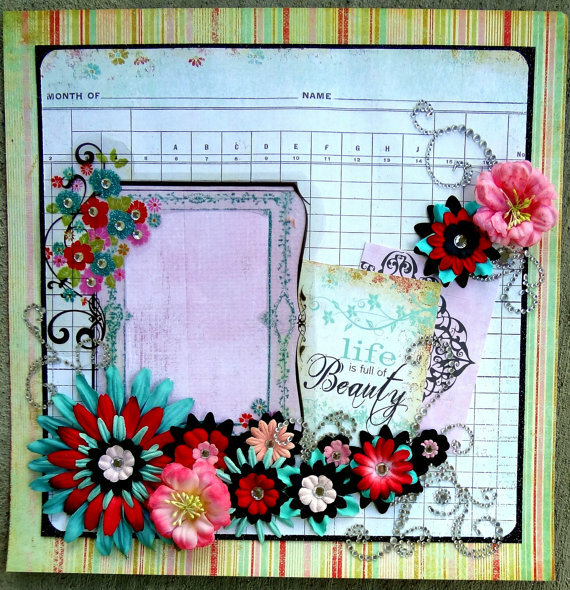 Scrapbook paper is perfect for….scrapbooking! Here is a page I made for my shop. Thanks so much, friends! Hope you feel inspired! Keep in touch – I would love to hear your ideas too, and see what wonderful works of art you create! Ahhhhh, the good ol’ family photo. 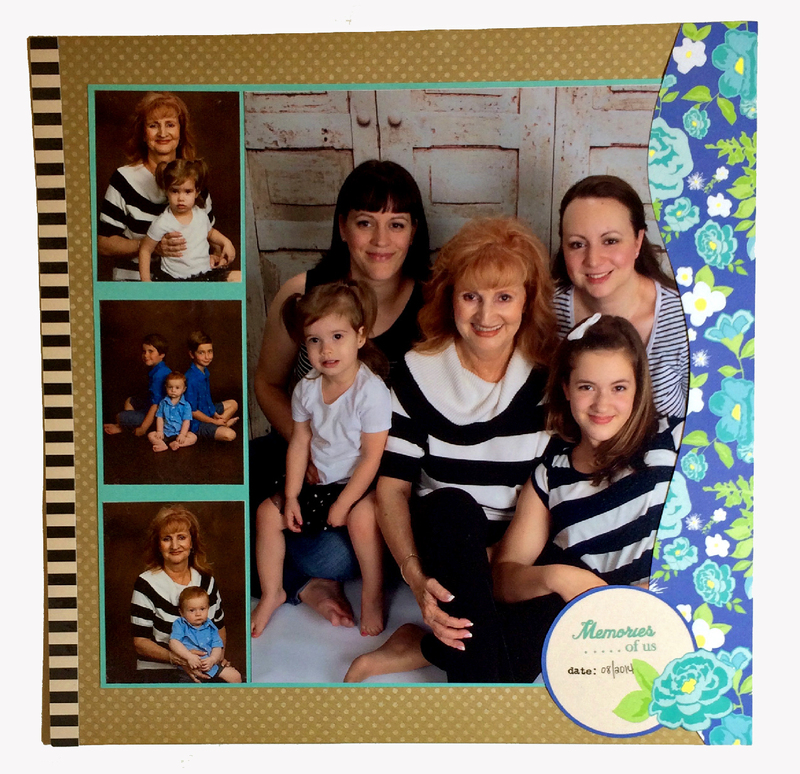 Priceless memories to frame and enjoy for generations. We conveniently forget about all the craziness that takes place behind the scenes in order to get that perfect group picture. and a perfect family photo for our wall.